At approximately 6:45pm on January 10, 2019, Officer Natalie Corona of the Davis Police Department responded to a traffic collision near 5th and C Streets in downtown Davis. A suspect approached the scene and opened fire, striking Officer Corona. Firefighters from a station directly across the incident scene responded immediately and began life-saving efforts. Officer Corona was then transported to UC Davis Medical Center where, tragically, she succumbed to her injuries. The suspect ran from the scene, prompting a manhunt throughout downtown Davis. Multiple law enforcement agencies responded to assist, surrounding a home near 5th and E Streets. Just before 1:00am, officers entered the home where they found the suspect dead of an apparent self-inflicted gunshot wound. 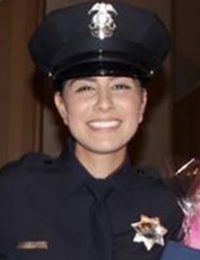 Officer Natalie Corona, age 22, graduated from the police academy in July 2018, and completed field training shortly before Christmas. She is described as an eager rookie who started with the department in 2016 as a Community Service Officer. Officer Corona is survived by her parents. This is the first Line of Duty loss in 60 years for the Davis Police Department.